My mother often hid green peppers in meatloaf, salads, oriental dishes, casseroles...and other things. The flavor was something that I could not appreciate nor tolerate. If I found pieces of green pepper in my food, I picked them out. I can, however, picture the day we all went out for pizza and the restaurant had more topping choices than the traditional sausage and cheese...my dad actually ordered a pizza with everything...which included green peppers. I don't know why I even tasted those horrid green specks, but I suspect that it probably would have taken too much effort to pick them out of the cheese. That day, was a turning point, I suddenly loved green peppers...at least on pizza. Decades of my life have passed and my flavor palate has expaned; as an adult, I can eat foods that I used to despise. These days, I love to find green peppers on sale or hanging heavily from garden plants...then next step, however, is to figure out what to do with all that green goodness. 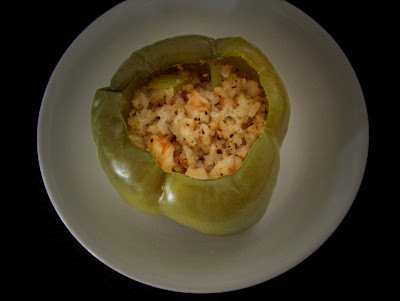 The recipe for today helps with that problem and is a variation of one of my favorites, a beef/tomato/rice stuffed pepper. This recipe, however, uses shrimp instead of beef and there are no tomatoes. While testing this recipe, I found the stuffing mixture to be bland and uninspired. I did not want to overpower the delicate shrimp flavor and chose to season the stuffing with an unusual choice which you will find below. This tasty, light recipe utilizes microwave cooking...perfect for a summer day. Cut slice from top of each peppers and remove stem end and seeds. Submerge peppers in large pot of boiling water. Boil for 5 minutes. Drain and set aside. Heat a skillet on med-high; coat with cooking spray and a scant tsp of margarine. Add celery, onion and garlic and saute for 5 minutes or until tender...do not burn the garlic. Remove from heat and add the chopped shrimp, bread crumbs, Parmesan, mozzarella, rice and pepper. Mix well. Spoon half of the mixture into each pepper shell. Put filled peppers into a microwaveable safe glass casserole dish. Cover. Microwave on high for 5 minutes. Remove to plates. Cool for 5 minutes before serving. Cut peppers in half and put 2 halves on each plate, filling side up. 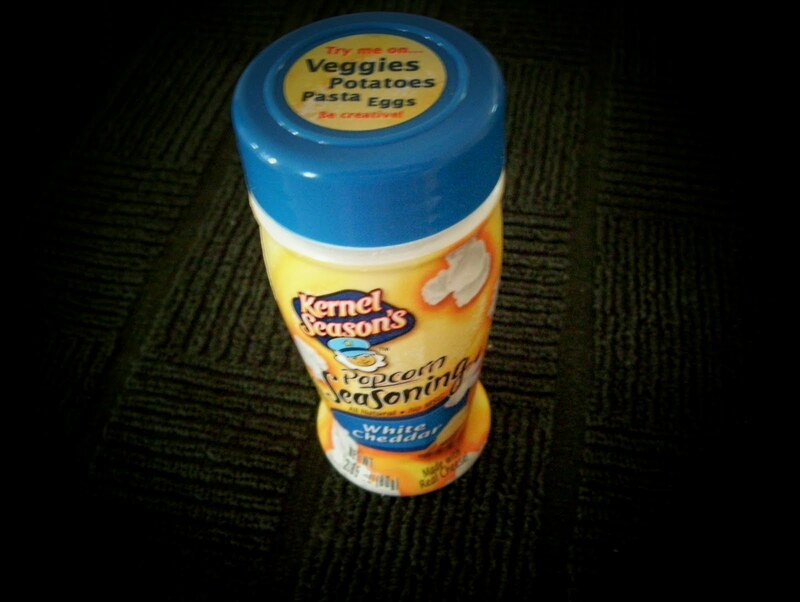 Sprinkle with white cheddar popcorn seasoning. Serves 2. (The lid top, says this seasoning may be used on vegetables. Something I had never noticed when I used it on our popcorn!) It is available in most stores near the popcorn in the snack aisle.